Dimensions: 12 " x 24 "
A play with pattern, size and color. The red crown is very noticeable on these birds. The delicate pattern of the feathers is less obvious. Bringing these 2 characteristics together is what drove me to make this piece. A small table tucked in the corner of at the Vatican Museum inspired me tremendously. The micro mosaic depiction of 2 ducks had the most stunning feather patterns, soft and lustrous. 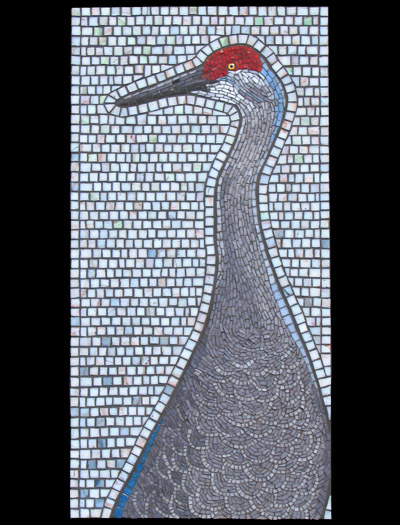 Though this Sandhill Crane is not a micro mosaic by any means, that style of work influences the way I use varying size tiles and grout lines. Invited to take part at "The International Contemporary Mosaic Art Exhibition"